When the executive director of Friends of the Pittsburgh Urban Forest (FPUF) approached me to help rebrand the non-profit, she didnâ&#x20AC;&#x2122;t just ask for a logo. It started with names, acronyms, and taglines that she could present to her board of directors. 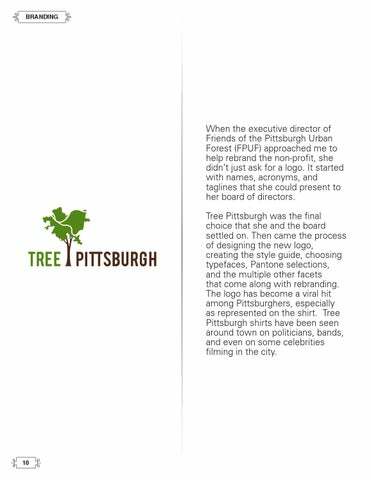 Tree Pittsburgh was the final choice that she and the board settled on. Then came the process of designing the new logo, creating the style guide, choosing typefaces, Pantone selections, and the multiple other facets that come along with rebranding. The logo has become a viral hit among Pittsburghers, especially as represented on the shirt. Tree Pittsburgh shirts have been seen around town on politicians, bands, and even on some celebrities filming in the city.